On Thursday, Dallas Cowboys LB Sean Lee left practice early due to hamstring tightness while Jaylon Smith worked as the first team MLB. The former Penn State Nittany Lion has been a stud when on the field – grading in the top-10 at his position from 2012-2016. 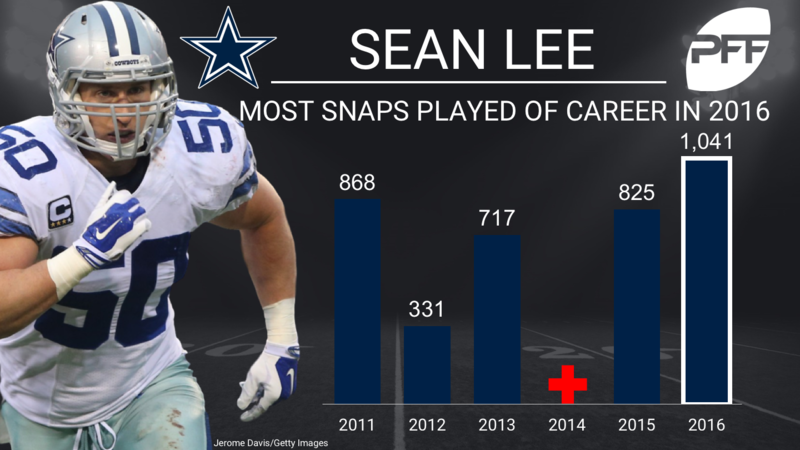 Lee has perennially had trouble staying healthy, but 2016 marked the first time in his career he played 1,000 snaps. To no one’s surprise, Lee topped all 4-3 OLBs with an 11.6 run stop percentage. Only Telvin Smith (41) had more total run stops than Lee (34). What makes Lee so incredible is not only his ability to play the run, but also cover with the best. His 85.2 coverage grade tied for sixth-best in the league.